Ideal for first-time players, the Squier Affinity PJ Bass Pack includes an Affinity Series Precision Bass with a powerful split-coil P Bass® middle pickup and a growling J Bass® single-coil bridge pickup. It also features a smooth-playing "C"-shaped neck and a lightweight, comfortable body. 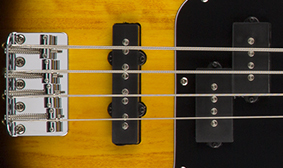 We also included a free 3-month subscription to Fender Play®—the easiest way to learn bass. 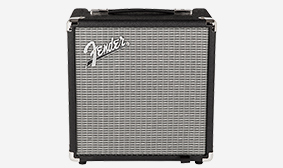 Delivering 15 watts of pure Fender bass tone, the Rumble 15 amplifier features an 8" Fender Special Design speaker, three-band EQ, headphone jack for silent practice and an aux input for playing along with your favorite songs or backing tracks. With the included padded gig bag, strap and 10' cable, the Squier Affinity PJ Bass Pack has everything you need to stop dreaming and start playing. 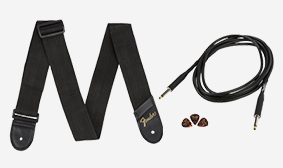 This bundle has everything you need to start rocking straight out of the box, including a comfortable and durable strap, padded gig bag and a 10-foot instrument cable.